As an avid John Green fan, I decided to trust his support of this novel. The book also looked like an appealing read. A quick glance inside the cover and a thumb through the pages provide a eerie tone for the novel, even before you begin reading the first page. Black and white pictures of children in what seems to be circus-like acts are scattered throughout the book. 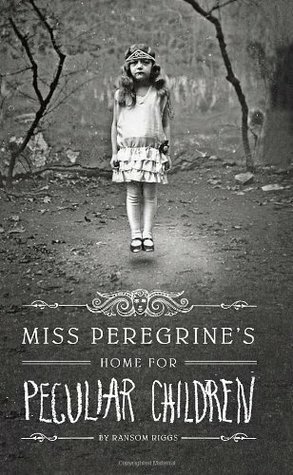 The entire novel feels like a giant scrapbook and invitation to an adventure with a group of “peculiar” children. 1. Environment: Ransom Riggs does a stunning job at setting up a creative and unique environment. This small island off the coast of Wales serves up heaping doses of mystery and diversity. While the island is small, it is filled with creative characters and settings. Without giving away much plot, the island is a setting that contains settings within settings. These micro settings are given as much detail as the larger, making it all flow together seamlessly. While I’ve never been to an island off the coast of Wales, I felt like I have because of this book—a sign of a talented author. 2. Dialogue: The one thing I struggled with in this book was the dialogue. While the plot felt like it was written for Middle Age readers, the dialogue was peppered with language that didn’t fit the age of the characters. Curse words were scattered throughout the novel, which I had no preference towards. Yet, they felt forced. The words seemed to be placed there in hopes of gaining older readers, for the plot alone was not intricate enough to do so. While the characters themselves are children, their words did not match their ages. In some conversations, they were far too mature, in others outlandishly immature. While this could make sense with proper character development, we don’t see much character development in the peculiar children except for the main character of Jacob. 3. Plot: The plot does take a bit of time to pick up, but when it does boy does it take off. I understood the slow plot development, for much backstory and setting development were required in order for the story to make sense. Many successful series have first novels that contain nothing but backstory and setting build up. I would not recommend to give up on this book, because the payoff is worth it. 4. Audiobook: I listened to this on audiobook, something I would not recommend doing. While the reader is a talented vocalist, his accents for the characters are distracting and downright cheesy. It takes away from the quality of the book, and gives the characters an irritating persona. You also miss out on the pictures and letters that are pasted within the novel. I find this to be an important aspect of the book that definitely adds to the spooky factor. I am really excited about the sequel to this novel, because it seems to incorporate more time travel and monsters. While this book had several slow parts, I am happy I stuck with it. This is a unique story that is unlike many I see on YA shelves today. It is equal parts creepy and suspenseful. I see good things with the progression of this series.